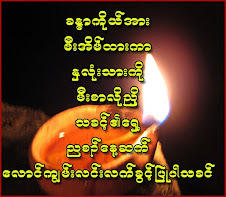 ဘာေတြ ဘာေတြလဲ . . . . .
ဟူး . . . . . . . There are some good things that we should not bring to the grave with us but leave it behind for the good of the following generations. I hope to leave something behind and created this blog! It is my wish that this be useful in some way for those who come across this blog. Watermark theme. Theme images by fpm. Powered by Blogger.